YIPPEE! That's all I have to say. No...I actually have a little more. Can you guess what today is?Today is my first day of WINTER VACATION. I didn't have to set the alarm clock, I could linger in my jammies, and I am finally finishing some of the projects for TPT that I've been working on as well as some of those around the house. It is actually going to be a staycation for the hubs and I as our puppy is in need of some TLC in his geriatric years. So gladly we are staying in town for the holidays. I'm busy booking dates to see friends, have dinners out, check out some new movies, and the list goes on! So this game is called Winter Time- Spin and Cover. All you have to do is print out the spinner board, the mitten board, and add a spinner along with a pile of snowballs (a.k.a. cotton balls). Students spin the spinner and cover the correct mitten with a snowball. The goal is to be the one to cover the board first. This can be played individually, in pairs, in centers, at your reading table, for RtI work, and with parent volunteers or peer tutors. VERY VERSATILE. I hope your kiddos will enjoy this. I look forward to trying it out with my kids too as even mine haven't had their hands on this new item yet. Give a shout out and let me know what your think and how it goes. So I wish you the best and safest holiday ever. And for those of you still in school for a few days, hang in there. It's a glorious feeling when it arrives so savor every moment. I look forward to creating many more great items for all of us to use in the new year. And I look forward to hearing from you all on a regular basis....so come follow along for the fun. So I just got back from my weekly grocery shopping trip and I wore flip flops! You may think that's not a big idea but I live in OHIO! It's the weekend before Winter Break and it's close to 70 degrees outside. Anyway, I got home to find a post for this linky and decided to participate. Holiday Linky Party- Check this Out! I thought this would be fun to do and in addition, you can find some new blogger buddies to follow, not to mention follow mine if you are new here! So take a peek below and I will do my best to answer all the fun questions! 1. My favorite holiday song...Jingle Bell Rock! 2. My favorite guilty pleasure food....Um...Potato Latkes! I never have the fried smell in my house any other time of the year except in December when celebrating Hanukkah! 3. Favorite Holiday Tradition...Sleeping in late on my break! 4. Favorite Holiday Book...I love "The Magic Dreidel" and "Hershel and the Hanukkah Goblin". So hard to choose just one. 5. Favorite Act of Kindness...shopping for items on our "Giving Tree" that is set up at school! I love fancy wrapping and have a wrapping station in my basement so it's always fun! 6. Favorite Holiday Memory...Since Hanukkah lasts 8 nights, one night was designated for a different part of the family. Hanukkah is truly a minor holiday and it always seemed we got pajamas one night and underwear another night! 7. Favorite Holiday Childhood Gift- I don't really remember anything specific. That's awful! 8. Favorite Holiday Craft- We used to make menorahs out of Popsicle sticks. 10. Favorite place to shop for holiday gifts- I'm a fan of online shopping these days. I think my neighbors might think I have a problem. 11. I hope Santa brings me...If Santa stops here, he has the wrong address! 12. My favorite product... my new December Word Work! While I have used this activity forever, I find it to be one of the most versatile activities in my store as far as usable in various grade levels and for differentiating in a single classroom. So best wishes to you and yours for a wonderful holiday season and great 2016. I hope to see more of you around here on my blog, on Instagram at taryns_unique_learning, on TPT (follow by clicking the green star at the top of the page! ), on Teachers Pay Teachers , and on Facebook at Taryn's Unique Learning- Facebook Page Facebook ! This winter is a Stay-cation for the hubs and myself. Our 15 year old little wonder dog, Izzy has held his own since diagnosed with Bladder Cancer and Congestive Heart Failure back in February '15. The vet assumed he would last just a few months and here it is, December and my best holiday gift is that he is still with us, tail wagging, and still on his same dose of medications with room to increase. His tail wags each morning when he jumps off the bed and runs to his food bowl so all is good in our world. This season has also brought about many new followers of "Taryn's Unique Learning" and for that I am extremely excited and grateful. Welcome to all of you and it's truly amazing to have you reading about my teaching happenings. Having had a TPT product featured in the newsletter has almost doubled my followers and my store is hopping more than ever. It is thrilling to know that materials that I have created have been downloaded 14,000 times (holy moly) and being in used in classrooms across not only the country but the world. I remember when teachers down the hall were the only ones using my materials so I'm truly amazed. So a super big thank you for being here. As you anticipate the upcoming holidays, I too have tried to provide you with some fabulous holiday items (AND A HANUKKAH FREEBIE!) to make learning extra fun and meaningful for your students. Hanukkah/Chanukkah/ Chanukah, however you spell it is the holiday my family celebrates. In case you are wondering why you've seen it spelled so many ways...it is a transliteration from a Hebrew Word so it can be spelled in English multiple ways. It is truly a holiday that gets tons of hype as it is timed closely to Christmas, although it's based on the Jewish calendar which accounts for the nonspecific date on which it falls each year. And it truly is a holiday for kids. So here is a freebie for you this holiday season. If you are teaching your students about various holidays and traditions, playing Dreidel is a tradition that Jewish Children all over the world play during Hanukkah. I know I did as a child! This is a fun way to incorporate a little math into your holiday season so I hope you and your students enjoy! Also, here are a few more items that may be of interest to you. And a special thanks to my friends at Fabulous Freebies for Teachers who set up this Blog Hop! Having a group of "virtual friends" is amazing fun and it's been great to meet these fabulous educators and entrepreneurs! Best wishes to them and you for a fabulous holiday season and amazing new year! Thanks so much for following the Fabulous Freebies for Teachers Blog Hop. We hope you found lots of goodies you can use and some new Sellers to Follow! Remember you can follow us by clicking the star near the top of each seller's TPT page. And if you would like to take one more hop through...just click the link below! Happy Holidays from your friends at FFFT! It is hard to believe that I am sitting at my desk in my home office, staring down the barrel at August. We are banned from school next week and I haven't been into my room/office yet at school and won't be allowed in until the week after next. So what's a gal to do? Just spend time making some great resources for you to use with your students I suppose. I would love to be able to share some of those with you to help you get ready for your school year too. All the items here are from my "Back to School Line" and would be super to start off your year with to establish classroom routines. The first item I want to share is brand new this summer. It is perfect for your emerging readers in K-1 and even for your struggling 2's or special ed students. This is a word sort of real and nonsense words. The photos on the cards are colored back to school supplies. They do not correspond with the pictures but are to enhance your Back to School theme. These cards all include a CVC word, real or nonsense. The goal is for your students to be able to sort them into two categories....Real and Nonsense. Two header cards are included to start off the sort. I've also posted a monthly activity just like this for the entire school year. And it will soon be bundled for cost savings to you. But here is a sneak peek! Oh...almost forgot to say that this could be a whole group activity with your kids sitting around the carpet with you, a small group activity at the reading table, a center activity, a super go to activity for that parent volunteer who needs something to do, or even for an older student tutoring your little people! CAN YOU SAY VERSATILE? Five different lessons are included with this product. All you need are your favorite magnetic letters. I prefer the red vowels and blue consonants and have included clip art magnetic letters to match. I post those letters on the board and my students sit around me with this page on a clipboard and with a pencil. They manipulate the letters to create a word and then we all record that word on the clipboard. We all participate and we all get to move around too. Depending on the grade level depends on what we work on while making words. K kids may focus on sight words, firsties may work on sight words and CVC words, 2's may work on blends/digraphs/endings, and 3's may work on multi-syllabic words. This is hands down one of the most utilized activities in my classroom and once your kiddos know the drill, it is a perfect activity to leave for a sub. And if I tell you that they could go at it for 45 minutes, that would not be a lie! Trust me on this one. Plus your sub will love you. My next activity isn't really a Back to School Item but it's a whole year long activity. It is called "All But Seven". It is a math game and included is the same game prepped for the whole year so I wanted you to have this right off the bat when school starts. It is a dice game and students roll two dice. The goal is to cross off all the numbers before getting "7" seven times. It is the most common roll of a pair of dice after all! It's a fun go to activity that is easy/low prep and your students will be highly involved. 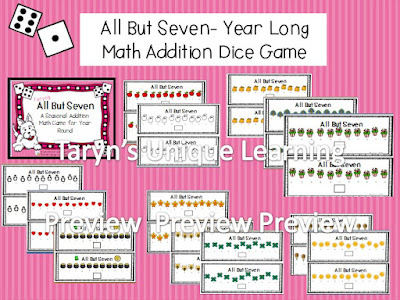 It is perfect for whole group math in pairs and for centers too! The illustrations are just perfect for each month. And September starts with of course, you guessed it, apples! Take a peek if it sounds like something your kids can use! And just a bonus for checking out all the above. I have included a FREEBIE for you to use. And this can be used for any grade level. I have included again, my birthday coupons for you. If you are looking for a cheap and easy "birthday gift" for your students, look no further. You can copy the whole page, give students a choice of the three coupons, or use any other way you see fit! My best wish for you is to have a wonderful, stress free, and fulfilling school year. Just continue to do what you do best. Have you ever wondered how your kiddos can remember the lyrics to every song they ever heard but they have a difficult time remember sight words when reading? I have always been amazed when kids sing songs on the radio, word by word, and it truly made me wonder. Just how can I utilize this auditory skill and bring it into the visual world for my struggling readers? This was definitely a big "ah ha" moment for me about eighteen years ago. So how did I act on this revelation? I began a new strategy and created an "I Can Read" Notebook for each of my students. At the beginning of the school year when supply lists were published, I asked all of my parents to supply a large binder/loose leaf notebook. I'm no longer in the classroom but think the request was for a two inch binder if memory serves me correctly. Of course, when teaching firsties, you have to instruct them on how to properly open and close the rings....because "OUCH". I know you know what I mean. This notebook became the source of my morning/wake up work, every single day. Each morning when my students trickled into our classroom, they found their "morning work" on a stool, right near the door. After hanging up their things, wishing friends good morning, that stool was the first stop of their academic day. Students picked up their paper and headed to their seats to get started. This paper always consisted of poem, song we learned prior to front load the lyrics, a finger play, a nursery rhyme, some repeated lines from a book we read,or a jump rope chant typed up on it, using all different types and sizes of fonts so students would learn the fancy "a's and "g's". Often times, the poem/song also had to do with a skill or concept we were learning about at the time. (Below you can see two of our pages used during our map unit.) Each page always included the author's name and sometimes included a picture to color, or a blank space for students to illustrate what the poem was "mostly about". By the end of the school year, students had 180 pages that could be read. Besides just coloring the page, students were told to try to read it first, find sight words and circle them, look for word family words, rhyming words, blends/digraphs, or any other skill that was appropriate for my students at the time. Sometimes it was a directed request and sometimes student chose on their own based on what they wanted to work on that day. We always did a shared reading of that morning's selection, incorporating finger pointing to stress one to one correspondence and the left to right sweep. We often had a class word hunt to try to find certain word wall words, rhyming words, or whatever else we were working on before closing our notebooks for the day. Also, during silent reading time, our notebooks were always an option to read for my students. At the time, I too kept a notebook with my masters organized with monthly dividers, which I suppose now a days, would be electronic. So how well do I think this strategy worked? Well let me tell you! Years later after my students were long gone, when often coming back to visit, many students told me that they still had their "I Can Read Notebooks". So I really feel as if I got a lot of bang for my buck and students cherished this activity. In addition, to support my newest revelation, I went on a mad hunt to collect books that were published versions of songs for children. Over the years, I have collected quite a stash and many more have become available for purchase. Each book could be "read" independently by emerging readers and did wonders to boost confidence in my students. And these are often the most beloved books by my students, which is obvious by the condition these books are in due to the hundreds of hands that have loved on the books. My next blog entry will include my top ten FAVORITE sing a long books, so be sure to stop back to see if any of yours made the list! Ten is going to definitely be a challenge! I think I have found the perfect way to incorporate a little more poetry into the curriculum! Well, maybe not the perfect way but definitely a great way. I've been doing this for about the last 23 years and it's very easy to do. You just need a few supplies and you will be including poetry on a regular basis. All you need are two half gallon milk cartons, uncooked rice, wrapping paper (seasonal), 6 poems printed, and some tape. It's really quite simple. This sneak peak will definitely tempt you to find out more. For complete directions and details....download my FREE directions in my TPT store. You will be amazed at how simple this is and how much your students will enjoy. I'm a Little OCD....Is it a Teacher Thing? Happy Mid-February to you. I've been missing in action but am back for this evening. I've been spending so much time working on new products for my store and well...it's February. That means tons and tons....and tons of testing for us. Plus, I've spent tons of time on paperwork and getting some of my intervention kiddoes through the RtI process. That conversation is definitely for a different day!